Najaf Ayat Allah al-Hakim Library (Maktabat Ayat Allah al-Hakim al`Ammah). 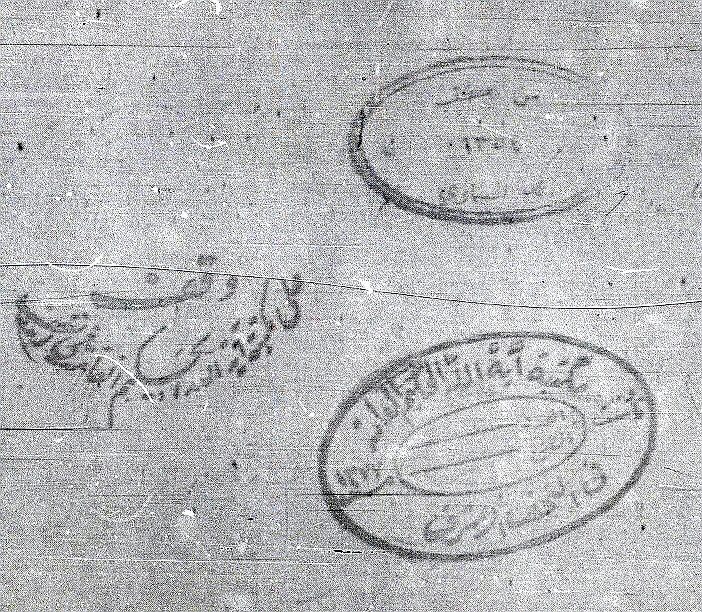 Manuscript page with multiple stamps—Left: Stamp marking the book as a waqf (deeded as a pious endowment) to the Ayat Allah al-Hakim Library in Najaf. Top right: stamp inscribed: “from among the books of Muhammad al-Samawi [year] 1354 (1935).” Bottom right: library stamp of the Ayat Allah al-Hakim Library in Najaf. “Libraries everywhere, including libraries in Iraq, are in the habit of putting ownership marks (such as rubber-stamp or seal impressions) inside their printed books and manuscripts. This helps them to keep track of their books and to claim and recover items that might be lost or stolen from their collections. The aim of this project – launched by the Middle East Librarians Association’s Committee on Iraqi Libraries – is to collect images (scanned photographs or photocopies) of library stamps and other ownership marks used by various libraries and manuscript collections in Iraq and make these images available on the Internet. The samples of ownership marks of Iraqi libraries, posted on this website, are intended for use as a reference guide by customs agents, investigators of Interpol and national law enforcement agencies, by honest dealers and other concerned individuals, in order to help identify books, manuscripts and other materials that may have been illegally removed from Iraqi libraries. It is very nice to see how these stamps evolve from these simple designs to the current exquisite and complex design.